With the recent release of the Wingnut Wings 1:32 scale Pfalz D.XII, the choice was obvious for the magazine’s feature article. The editor builds the aircraft and uses 10 pages to take the reader through a step-by-step process of how to get the most out of this kit. There are plenty of helpful tips along the way with over 40 colour images to compliment the text. For those wanting to add a bit of extra detailing, another 7 close-up photographs of surviving museum examples adds some grist to the mill. Lance Krieg is back with the third installment of his detailed look at struts and rigging techniques. This time around we learn about functional and non functional rigging and the best ways to replicate it. Enhancing your struts is also covered as well as potential methods for repairing the structure when things don’t work out as planned. As always, dozens of images clearly illustrate the path to enlightenment which is covered over 6 entertaining pages. 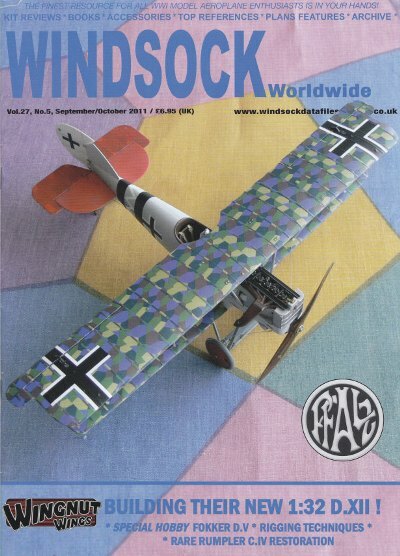 The publication’s second build review is aimed at the Special Hobby Fokker D.V. To assist with the narrative, a helpful sequence of photos lets the modeller see what they’re in for. Covered over 3 pages, there are also a couple of handy period images and a sketch showing the means of strut attachment to the wing spar. Koloman Mayrhofer’s latest project is the restoration of a rare Rumpler C.IV. It’s 1463/17, which was shot down on 11 September 1917 by a member of Escadrille N.5. The occupants from Fl.Abt.224 were killed and the ravaged remains of the aircraft sat rotting away in the bowels of the Brussels’ Army museum. This feature hopes to the first in a series of updates that follows this project through to completion.